Oral Surgery may be required for certain dental procedures. Canyon Dental Centre provides oral surgery services including extractions, bone grafts and sinus lifts. Our team will do everything we can to save your tooth, but sometimes the best decision is to remove it. To learn more about your oral surgery options, please get in touch with our team. Wisdom teeth are generally the last to emerge from your mouth and can start showing around the ages of 18-20. Depending on the way your wisdom teeth are growing, you may need to have them extracted. If they are crowding your teeth, causing pain/discomfort or are infected, your dentist may recommend an extraction. A sinus lift is a procedure which replaces lost bone in the upper jaw. They are done for patients who require extra bone be added to the upper jaws in the molar and premolar areas. A gum graft is a procedure done to thicken gums and may be necessary to protect your teeth from the damaging effects of gum recession. You may also consider a gum graft to improve the appearance of your smile. 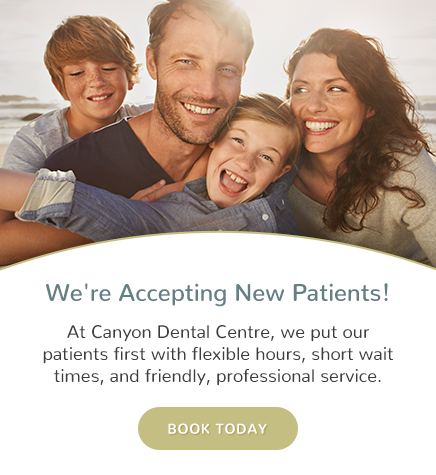 We use the Pinhole Surgical Technique at Canyon Dental Centre. The procedure length depends on your level of gum recession. It can take about 1-2 hours. You should be able to return to normal activities the day after surgery, but it will take a few weeks to fully heal. Your dentist will give you instructions on how to care for the area after your surgery. In order to receive dental implants, you may require extra bone support if you have experienced bone loss. Bone grafts involve adding extra bone to your jaw to support a dental implant. Bone grafts are available at Canyon Dental Centre for patients. If you have a lost tooth and require an implant Dr. van As will evaluate your current jaw bone to see if there is enough quality bone to place the implant.